Known as the wonderful time of the year, Christmas is almost a merrier chance for everybody to spread the cheer and make everyone go “Oh Deer.” The idea of a warm fireplace, snow blizzards, reindeer pulling a sleigh through the night sky seems mystical, however, it is the interior that contributes to the festive mood and adornments across the space that makes the celebration atmospheric. Sparkling lights, Christmas tree, secret socks, there’s a whole different world when it comes to Christmasy decorations. 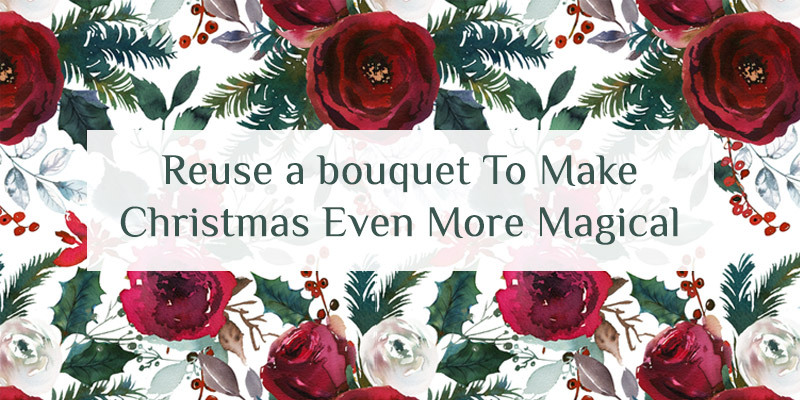 Ever wondered to celebrate the holiday season with garden fresh flowers or the bouquet you just received? Well, if you haven’t thought of it, you can still make the most of the idea and splash colors to this year’s seasons greetings. Flowers lets the hearts talking, are a treat for the eyes, and when it comes to decorations, these pack up a punch every time they are displayed. 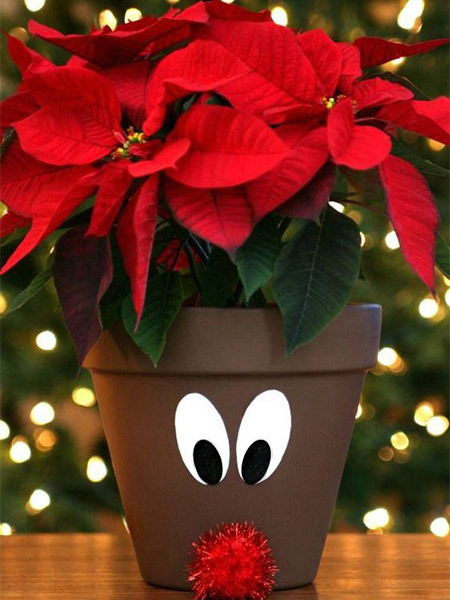 Following are a few ways to display flowers for a happier ho-ho-ho day! Give your party guests an entrance to remember. 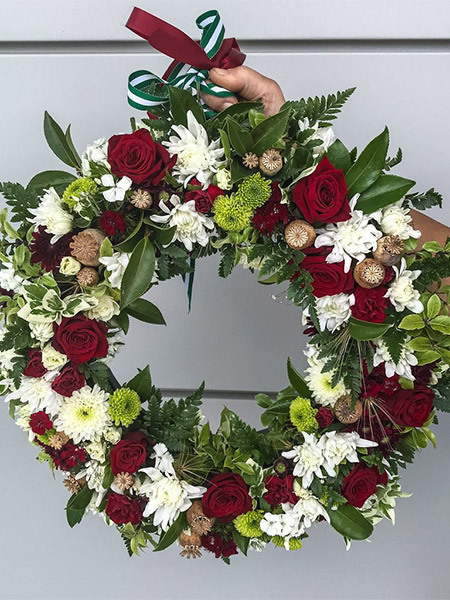 Like a stroll around a garden, a flower wreath can spring up the party and get everyone do the boogie soon after they knock on the door. Embellished in the Christmas theme, it is the best one to make use of the leftover flowers and fillings of the bouquet. Send your warmest wishes with all your creativity intact. Following the simple pressed art technique, colors, sheets, glue, and scissors, you can couple your presents with Christmas cards! 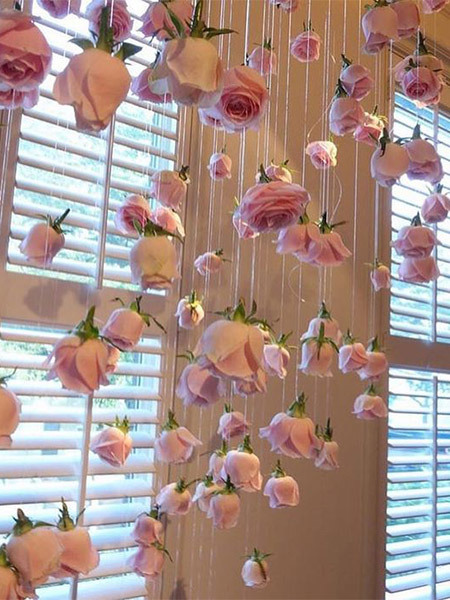 With flowers put to use so creatively, this will preserve the moment for quite a long time. The tree is always there, all we need year by year are the adornments! Isn’t it? Well, flowers can be the gorgeous route to festive decor. With a little color, flowers can reinvigorate your spruce tree into a tall, vibrant bouquet. 4.Celebrate The Weather With Floral Get Togethers! Christmas trees, Holiday themed table settings, a fireplace, wine glasses, who would have thought flowers would fit in between? 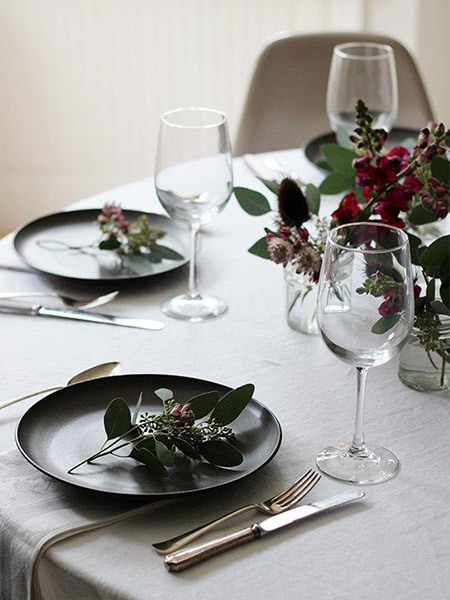 Well, bringing the spring indoors, flowers along with the flawless table settings can give everybody a chance to see how these little flowers can transform into great statement makers! 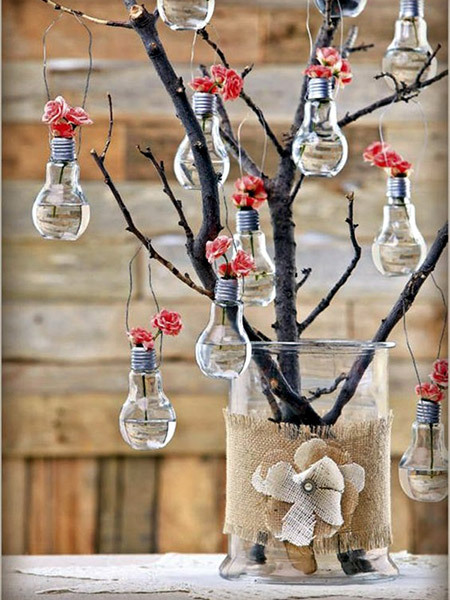 Decorating old, diffused bulbs into a decorative hanging with flowers is we are pretty sure you never think off. Give a makeover to your patio or to the corner of the room with this artistic idea. All you need to do is garner all the worn out all the bulbs and blossoming flowers and see how this will keep everybody’s eyes glued to it. 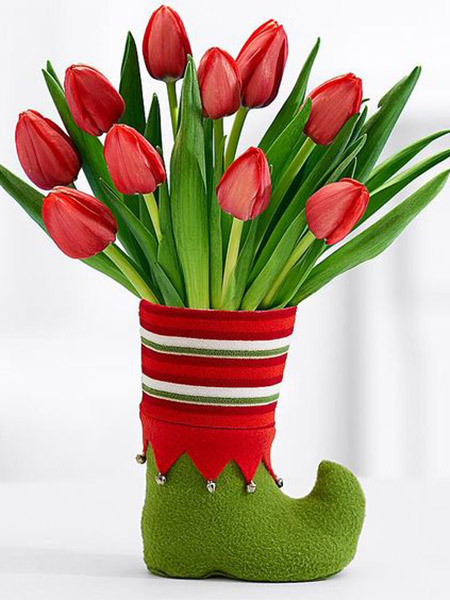 Invite the Santa’s little helpers with some floral joy with these little Elf boot decorations. 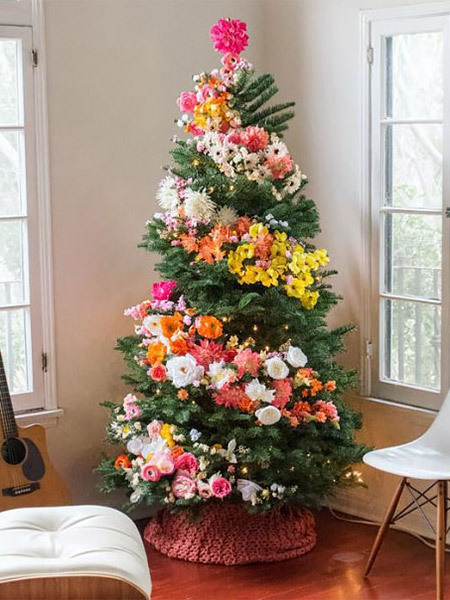 Beautifying every corner of the living space, it can still make the ho-ho-ho statement under the floral Christmas tree. Unwrap the bouquet and place the flowers in the socks and to keep it erect, you can even use pebbles or the crumpled paper balls. 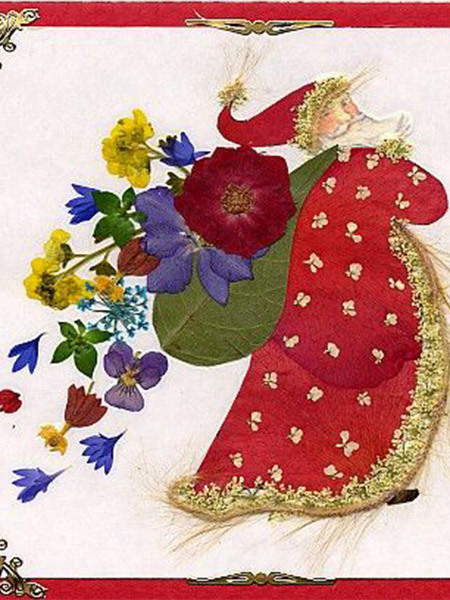 Relish Christmas in its truest essence with flowers! Adorn the indoors with these or make an imperfectly perfect wall hanging. This will be the colorful snowfall your party guests have ever witnessed. In fact, you can make these with paper flowers and use the garden leaves as well. 8.This Year, Don’t Miss Out To Make Everyone Go Oh Deer! Did you know without reindeers Santa wouldn’t come and without Santa, there won’t be any gifts and without gifts, Christmas is just a gathering. And thus, to welcome these little pets of Santa, how about pots crafted in their color and theme and tucking these with flowers from your garden! 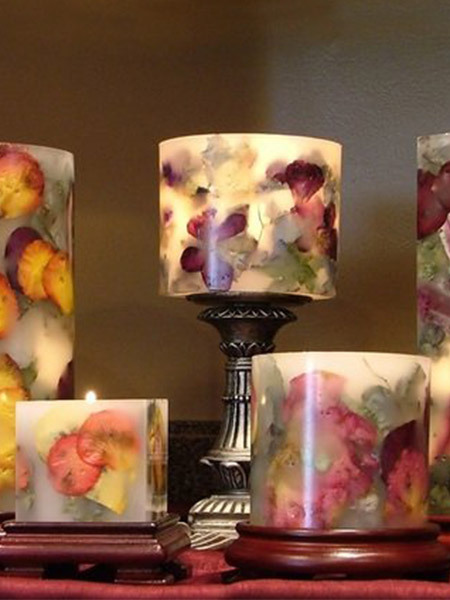 9.Give Christmas A Light With Floral Candles So Right! A mandatory part of the season, candles can uplift spirits, especially when infused with flowers. Give your Christmas celebration, an aromatic therapy it needs. Mix up things, colors, wax, and dried flowers and pave the way for the Santa to come and drop bagful gifts at your doorstep. 10.Reach For The Skies, Drink Roses With Thine Eyes! Roses have become essential in day to day culinary art. And with Christmas almost a knock away, you can grab the chance to thrill your family, friends, and party guests by serving up a cocktail with rose ice cubes that give the required the mellow hint to every drink!